The great thing about changing sports after so long as a runner is the new experiences it has afforded me over the last year. One of my highlights has been learning to ride a fixed wheel track bike at the Olympic velodrome. There is something beautiful about the simplicity of track, and track bikes. No gears, no breaks – no stopping pedalling!! 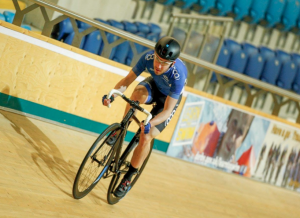 On 20th February I took part in my first ever track races (s), an Omnium at the Derby velodrome consisting of a flying lap (one 250 metre lap as fast as possible), a 500 time trial, a 2km time trial, a Keirin heat and final (the one where you ride behind a motorbike), an elimination race, where all 28 riders started and each lap a rider (the last one across the line) is eliminated from the race, a 50 lap scratch race (a traditional race, everyone starts at the same time and first across the line wins) and a 50 laps points race, where points are awarded to the first 4 across the line every 10 laps, with the points added to the overall score. 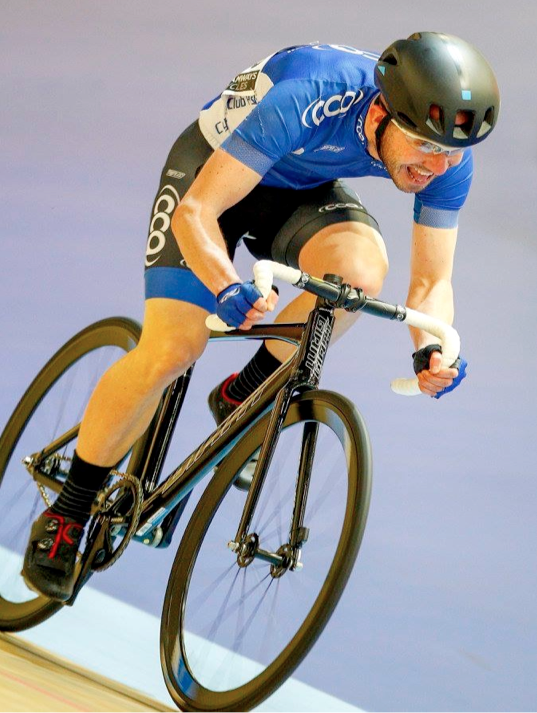 I found the Omnium brutal, with the short powerful ‘sprint’ events taking their toll on my legs early in proceedings, but I was happy to get through the event in one piece and still smiling, at least on the inside!. I was pretty happy to finish 9th overall, and found the longer events great fun, and more to my suiting than the sheer power events. I then had the pleasure of taking my daughter Ellie to watch a session of the World track champs at the London Olympic park – even getting to see the great man WIGGO in action in the men’s team pursuit heats. What a day and what an atmosphere!! March 2016 and it was back to the road, this time taking on my first road race of the season, the Cresta Regional A road race in Essex. A 115km race over 7 laps of fairly tough (or at least it felt tough) terrain. I was very nervous about the distance of this race, the longest I have tackled, and after 3 of the 7 laps things were looking grim as I dropped from the main group, luckily I was able to join forces with a couple of other club mates to rejoin the fray, and surprised myself by actually feeling good on the last lap. The race finished uphill, and despite a pre race warning not to attack too early on the hill, I unleashed what felt like a good attack, only for my legs to fold within sight of the finish line. I learnt a lot in this race, and despite the disappointing last 150 metres and subsequent position there were more positives than negatives. 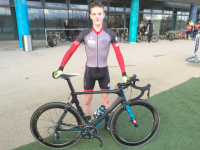 My first race as a cyclist was a CRIT race in Milton Keynes in March 2015. I was LAPPED, from memory twice. So returning on 19th March this year I was worried of a repeat. In probably my most encouraging performance to date, I avoided being lapped, and actually attacked the main group with a lap to go, holding third position into the last bend. I couldn’t hold this to the line, but was left feeling that a year’s hard work was paying off, and for the first time in the last 14 months have started to think of myself as a cyclist. For all cyclists the winter is a tough time to train, I’m a big advocate of rollers and indoor training, however I’m loving the sun starting to emerge, and having the opportunity to ride outside more. 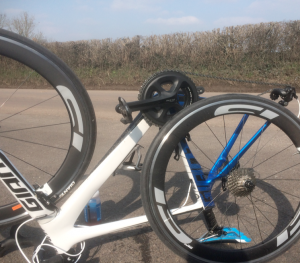 The only downside is punctures…..I managed three in a three hour ride last week. As I sat at the side of the road fixing a puncture with a less than adequate pump, a fellow cyclist pulled over and asked if I was ok – lending me his far better piece of kit to inflate my tyre. Acts of kindness and camaraderie like this are not to be undervalued and I vowed there and then to act in a similar fashion should the occasion arise!! On a positive note, punctures on a sunny day aren’t so bad!!! 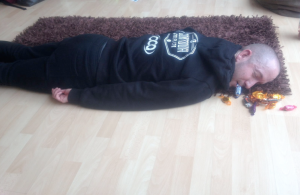 I’ll be cracking on with my chase for points between now and my next blog… and hope to have less than 190 of my 200 points target to go when I next report back.